The Pirastro Gold Label Violin D String is ideal for the modern musician requiring a classic sound. The gut core produces a range of complex overtones which support a bright overall sound. The silver winding adds a layer of protection to the string's core, as well as adding depth to your overall sound. The medium gauge tension has the optimum versatility of a loud projection and expressive playability. This string features a knot tailpiece end and is designed for full size violins. 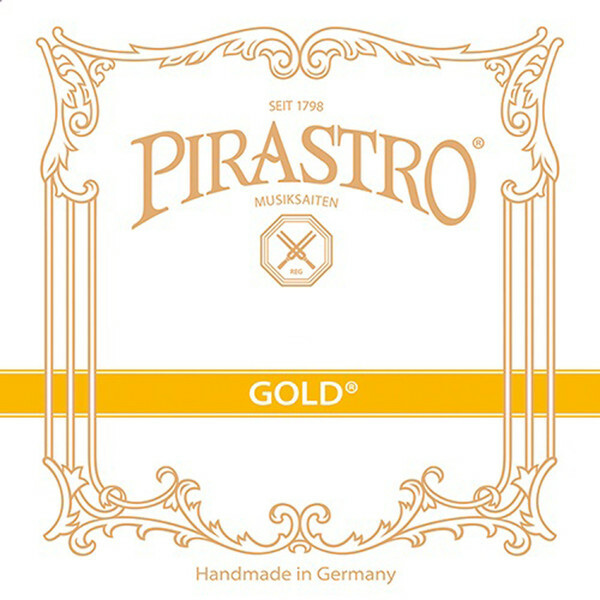 The Gold Label Series of violin strings offer musicians a traditional tone with modern playability. The steel and gut cores are matched to complement each other’s frequency ranges. The gut cores are all crafted, wound and polished by hand for the most authentic feel possible. The Gold Label series strings’ key feature is their easy playability, which makes them ideal for developing musicians wanting a traditional sound. This string series is ideal for musicians wanting to upgrade their string quality as their ability progresses.